Paper receipts, when are we ever getting rid of them? Many times I thought about why there is not a solution that is directly connected to your bank statement where you could download digital receipts for each transaction when needed. Well, anyway, as for now we have to go the other way around and scan those papers. 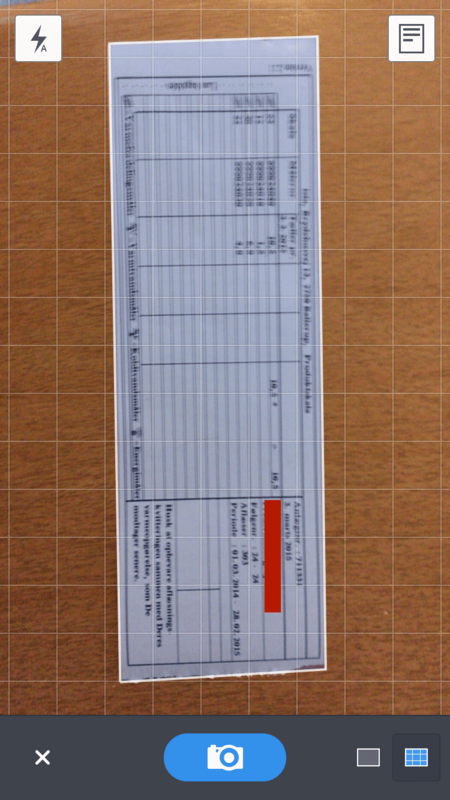 I’ve tried quite a few iOS scanner / receipts utilities and there sure are a lot of them. They differ quite a bit in features and it is hard finding one that suits your specific needs. After doing the rounds I decided to stick with Scanner Pro and here’s why. I use Scanner Pro to scan my day to day receipts and bills, just to have access to them if I would ever need them in the future and the app makes the process quite painless. Open the app and choose the folder you wish to put the receipts in and then click the scan button. Many other apps open up straight into the scanning mode, quite a nice feature which reduces the amount of clicks it takes to get started, but for me I actually prefer getting to choose which folder I want to put the scan in first since I have them categorised by year and then month (eg. “Receipts and bills/2015-01 – Receipts”). Each sub-folder (“2015-01 – Receipts”) contains the actual scans of receipts and in reality it is a multiple page PDF document. Starting a new scan from within your folder brings up an interface that shows border detection (much like Cam Card does when scanning business cards) and a grid to help you center the photo. Border detection works really good and saves you from getting unnecessary clutter in your scan. When you’re happy click scan and it grabs a picture of just the receipt and then you proceed on to post processing. Post processing is basically you choosing if you want the scan to be in full colour or the black and white contrast mode (which I prefer) that brings out contours making text easier to read, making it look like an actual scan. The sweet part about all this is that you can choose to automatically sync all your scans automatically to either Dropbox, Evernote, Google Drive or WebDAV (ideal if you want to keep things on your NAS for example) and the sync is seamless, I feel confident I can always access a receipt in Dropbox if I would ever need it for let’s say a warranty issue. While we’re talking sync, iCloud (including iCloud Drive) is in there as well, so I can use Scanner Pro on both the iPhone and iPad (yes they do support iPad as well) without problems. What makes it stand out against the competition? For me it is because it feels stable and trustworthy, especially when it comes to syncing platforms provided and the stabilisation and border detection routines, they just work. When looking at the competition some of them require that you register an account with their service, or don’t offer border detection, or they (TurboScan) just take colour scans (basically a photo) that they make black and white without edge detection routines etc . Stumbled onto quite a few that just keep nagging that you should get their other products or rate them in the app store (PDF Scanner), small things like that can put me off. Here’s how it looks after the scan has been processed. You’ve got a selection of settings to improve the quality. There are some things I do miss from Scanner Pro however; OCR would be nice so that you could search text in your receipts and if they get that right, why not add business card scanner as well? That would be sweet! I would also like to be able to at least be able to choose to be able to start the app directly in scanner mode. Quite recently Evernote released their Scannable app which I will try some more in the near future. I am not all invested in the Evernote infrastructure so I haven’t really prioritised it yet. I did some basic test and found that it doesn’t seem to be able to create a folder structure directly in the app, instead it sends the scan straight to Evernote for organising. In Scanner Pro I always have access to the scans in the app.